The most important thing – do not put in the habit to brake in turns. We bought ski when the child was a one year old. Spontaneously. In Austrian shop we saw a tiny ski boots for a very cheap price, and could not resist. Also we bought the smallest ski. 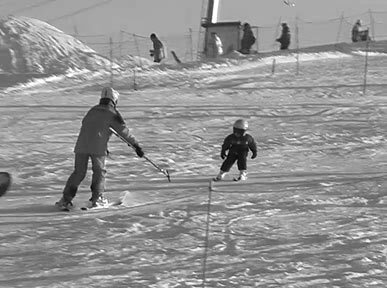 The child could walk well already, but legs were still weak for skiing. A year later, when the child was two years old, we began to go to Krylatskoye and do there two exercises. 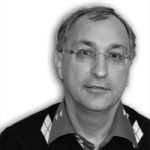 The first one (main idea was founded in Internet) – a direct downhill, but at a controlled speed. The speed of child is controlled by an adult. Going ahead of the child but faced to him (that is, you go backwards) at arm’s length. Once you see that the child succeed his comfortable speed then gently stop him. So from a child is only required to ski directly and have fun without worrying how to stop. I used “snowblades” – ski of one meter length, looks more like to skates for the snow. The second exercise I took form coaches Nelly and Mikhail Loginov, who taught children in Krylatskoye. This requires a stick, better a little longer than the usual ski pole. It is necessary to ski alongside the child, the child hold on to the stick. Adults need to hold the stick firmly, because the child is using it as a support. The purpose of such drive – to get accustom to turns. Time to time you can put the child between your skis, holding his hands and go a little faster. So do many parents as it is most convenient for the adult. But I did not do it often, because you can not assume that the child feels that he rides by himself. I underline that not taught how to brake and how to stop in that season – and do not focus on it. Not only because of the fact that I think it is wrong for begin. In braking and stop one need more forces in the legs than for just drive. My 2-years-old child did not have these forces yet. 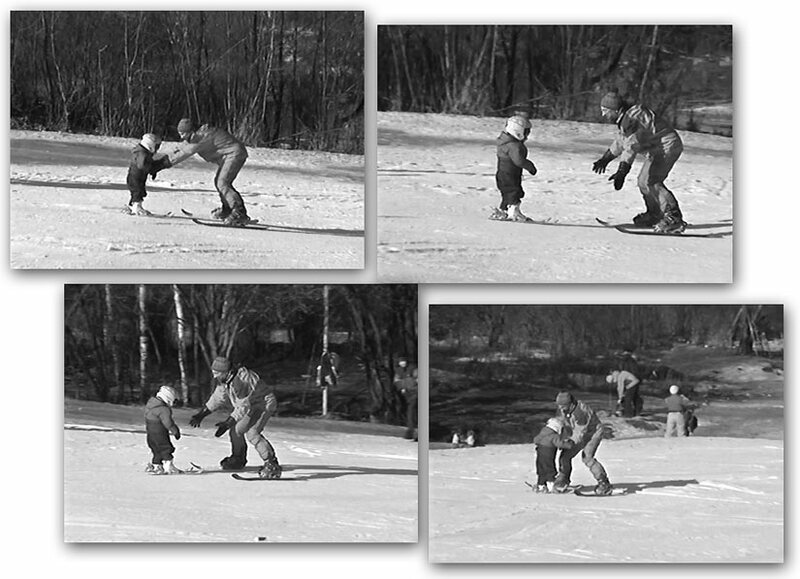 The next season, when the child was 3 years old, we continued the exercise number 2 (with a stick) with increasing speed and steepness of turns, and at the end of slope where it more flattening we went on to exercise number 1, but slightly modified. I launched a child, and then went not in front of him but alongside until it was necessary to stop. It should be noted that the speed of the child is much less than the speed of the adult, so no problems for adult to be at right time in right place. 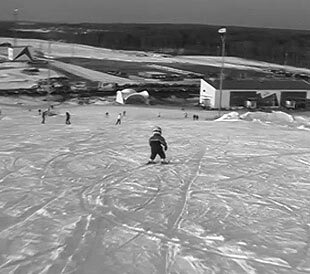 To the end of the season child began to ski by himself with round turns and could control the speed. 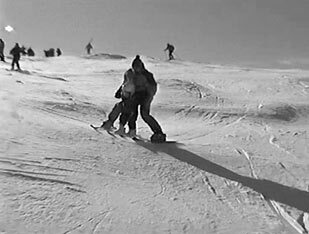 I again begin to ski in front of him, face him – to monitor the situation around and in case if child loose control of speed to make him stop. Then began to learn him to stop – based on the technique of turns. Then he began to ski himself, but I had to be near behind, as he could not stand up if fall. And then he learned to stand up. 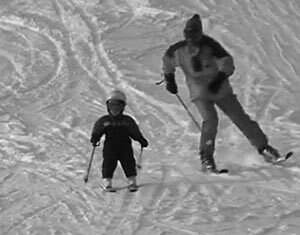 Actually that’s all, child put on to skis: he can and loves to ride in a straight line, he carves turns without skidding, he is able to stop, to stand up after a fall. The main thing – he can ski with a fun. The next season (4 years) we did not do any exercises and only have a fun.